East African leaders have renewed their calls to the UN to replace the beleaguered African Union (AU) peacekeeping mission in Somalia. At a meeting in Addis Ababa, Ethiopia, Somalia's president said a radical strategy to end almost two decades of crisis in the country was needed. The leaders of the regional grouping Igad also agreed to deploy 2,000 more AU peacekeepers to help the government. 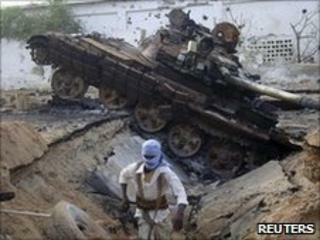 AU troops have been battling Islamists who control most of southern Somalia. The UN-backed government only runs a few parts of the capital, Mogadishu. Fighting continued in Mogadishu while the summit was being held, with at least five people killed when militants attacked government positions in the north of the city, officials say. Speaking at the hastily convened meeting in Addis Ababa, Somali President Sheikh Shariff Sheikh Ahmed said that his country was in the hands of al-Qaeda and extremist groups. The main militant group, al-Shabab, has links to al-Qaeda. The president also made an impassioned appeal for an urgent and radical strategy to end the crisis. Previous Igad meetings have also called on the UN to replace the 5,000-strong AU mission. The UN has agreed in principle but has not set a date for the switch. Analysts say few countries will be willing to risk sending their soldiers to the chaos in Somalia. Uganda's deputy foreign minister told the AFP news agency that his government could send extra troops but only if the AU mandate is toughened to let the peacekeepers go on the offensive. "Uganda is prepared to put more troops on the ground only if the mandate is changed such that we can go after al-Shabab," said Okello Oryem. Frustration with the Somali leadership's failure to contain day-to-day violence in the country has been growing, the BBC's Uduak Amimo in the Ethiopian capital reports. The major headache for Igad is that there does not seem to be much commitment from Somalia's political class or from the UN to helping the country out of the political violence. The government's mandate expires in one year but it still has not met most of its objectives on reconstruction and reconciliation. Igad has also reminded donors numerous times about their pledges to finance Somalia's reconstruction. Igad's members are Djibouti, Ethiopia, Kenya, Somalia, Sudan and Uganda.